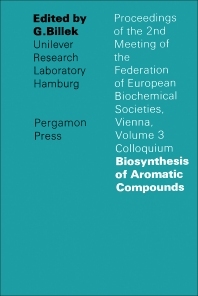 Biosynthesis of Aromatic Compounds is a collection of papers from the Proceedings of the Second Meeting of the Federation of European Biochemical Societies in Vienna, on April 21-24, 1965. This volume is based on lectures given at the symposium and covers the studies made on the biosynthesis of aromatic compounds. The first part discusses the biosynthetic intermediates in polyketide biosynthesis in connection with the biosynthesis of fatty acids; it also notes the biosynthesis of coumarins that form from derivatives of carbohydrate metabolism. Other results concerning the biosynthesis of benzoic acids and on compounds such as substituted benzaldehydes and benzylalcohols are presented. Another paper shows that when species of mycobacteria are grown under iron-deficient conditions, salicylic acid can be produced. The second part focuses on studies made on the biosynthesis of aromatic compounds that contain hetero atoms. The formation of aromatic systems in alkaloids and the biosynthesis of some alkaloids based on aromatic precursors are analyzed. The book explains that some flavor compounds such as mustard oils are the product of enzymatic hydrolysis of thioglucosides, and then notes that the biogenetic schemes of Mentzer et al. concerning another study are not suitable as working hypotheses. This collection can be read profitably by chemists, biochemists, and academicians involved in aromatic compound researches.